So on Mardi Gras eve, Mark came along with us, and it was good. It was in fact, excellent. Thai La-Ong – there is something about the name that just makes me want to keep saying it aloud with a cheesy faux-oriental accent, stretching out the ong. It put a grin on my face even before the food arrived at our table. Thai La-Ooong is a shockingly green, double-wide restaurant occupying two shop fronts. It was busy when we arrived, with a young, happy and loud crowd, so there was no chance of a window table. We settled down at a table in the middle of the second room, and Mark immediately showed off his Thai language skills by addressing the waiter in lingo (he can say hello and goodbye apparently), so we immediately appointed him our ongoing expert in all things Thai . He further impressed us with his local knowledge by pointing out that this place used to be a Vietnamese favourite called Old Saigon (he was close, Old Saigon was down the road a bit where Thai La-Ooooong 2 is now, according to Strop’s inter-webby research). Number 37 on the menu turned out to be in the stir-fry section: Pad Katiam Prik Thai – pepper and garlic with vegetables. In what seems to be a Thai restaurant tradition, the stir-fry and curry parts of the menu give you a choice of species for the protein component of your meal. We had a lively discussion about whether to double up on poultry or ungulates, chicken and duck versus beef and pork, until we realised that for an extra $4.90 we could rope in seafood by choosing prawns for the Gang Dang red curry, and avoid the issue altogether. We opted for pork with number 37 and also ordered Yum Ped Yang, the roasted duck salad. 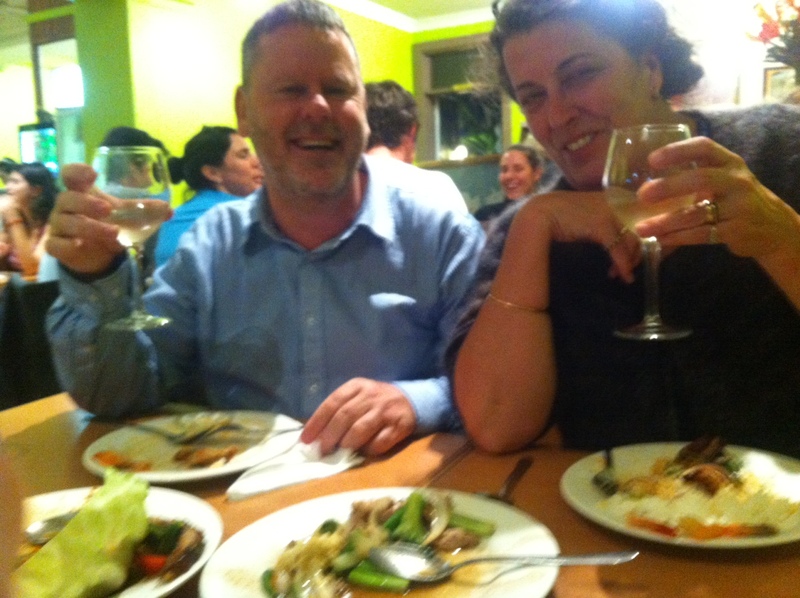 The service was quick, we had hardly cracked our bottle of NZ Sauv Blanc before the first dish arrived. It was number 37, and it was good, with clean fresh flavours. The other dishes arrived in rapid succession, the curry and then the salad, and the food kept getting better and better. The duck salad was the clear winner but it was all very good. The only hiccup came with my first bite of the prawn curry, and unfortunately it wasn’t alone. Much to Strop’s amusement, I have developed Late Onset Chilli Induced Hiccup Syndrome, and it doesn’t take much chilli to set me off, the prawn curry wasn’t exactly a scorcher. I suspect that I may have missed out on my fair share of the food as I clamped down on my spasming diaphragm, trying to break the cycle of amusing convulsions. Can I hiccup and take a photo at the same time? When it came time to pay we had the good kind of bill-shock. Mark thought they had given us someone else’s bill, presumably a lone diner’s. 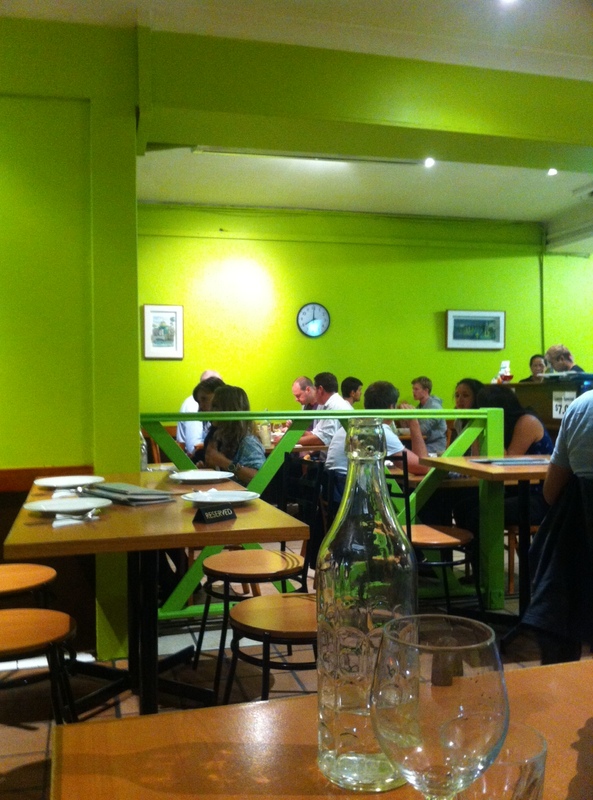 This place is way better than you would guess from the colour of the walls – very good and very cheap. Next up is an old favourite of ours, Rowda Ya-Habibi. It will be the first time that we have applied the Painting-the-Bridge blowtorch to the belly of somewhere we know. Will it survive intact?